In September of 1990, the World Summit for Children brought together the largest ever gathering of Heads of State and Government in the General Assembly of the United Nations in New York. The aim was to discuss the possibility of saving millions of young lives every year, at very low cost, in the world’s poorest communities. By the end of the day, more than 70 of the world’s political leaders had agreed to draw up national plans of action to try to bring this about. See below for a summary of the action that followed. The Summit opened with a twelve-minute video written and narrated by Peter Adamson and titled “341” – the number of children who would die during the time the video was screening. Made by P&LA in conjunction with BBC producer Peter Firstbrook, “341” was followed by the opening speech to the Summit by UNICEF Executive Director James P. Grant. The special edition of the State of the World’s Children report for the World Summit (see photo) was also written and produced by P&LA. Almost all nations – one hundred and twenty nine in all – have now reached, and sustained, immunisation levels of 80% or more. About ninety of those countries have passed the 90% immunisation mark. Compared with the toll in 1980, more than three million child deaths from measles, tetanus, and whooping cough are being prevented every year and the normal growth of many millions more is being at least partially protected. The number of children being crippled by polio has fallen from 400,000 a year in 1980 to under 100,000 a year in 1995. ORT is being used in some form by about two thirds of all the families in the developing world – saving at least a million young lives a year. Iodine deficiency, the world’s major cause of mental retardation, is close to defeat. Of the more than 90 developing countries with iodine deficiency problems, 82 have now passed laws requiring the iodization of all salt – and most are close to the target of 90% salt iodization. In total, 1.5 billion more people are consuming iodized salt today than in 1990 and at least 12 million children a year are being protected from some degree of mental damage. Seventeen developing nations, including some of the largest, have eliminated Vitamin A deficiency and the deaths and the blindness it brings to their children. A further 24 countries have launched nation-wide Vitamin A programmes. 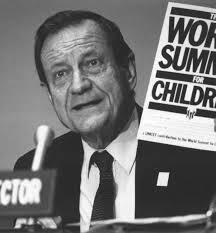 UNICEF Executive Director Jim Grant opens the World Summit for Children after the screening of "341"